If you type the word ‘STEM‘ and ‘female’ into Google search, chances are you’ll see an extensive list of articles concerning the lack of female representation in STEM orientated careers. This isn’t a new dilemma, it’s historical. Before I begin elaborating on this subject, I should probably explain how I first became aware of the extent of this problem. If you’re already familiar with my blog, you’ll know that I’m a 3D Visualiser (also known as an Architectural Visualiser). A female 3D Visualiser, working in a an extremely male dominated field. But these figures are indeed reflective of a wider, universal problem. According to CGArchitect’s 2014 survey, the most common educational background of both male and female Architectural Visualisers is Architecture. I can see the link but in my opinion, this area of work would fall within the genre of Computer Science. And the genre of Computer Science is one of the STEM subjects: Science, Technology, Engineering and Mathematics. 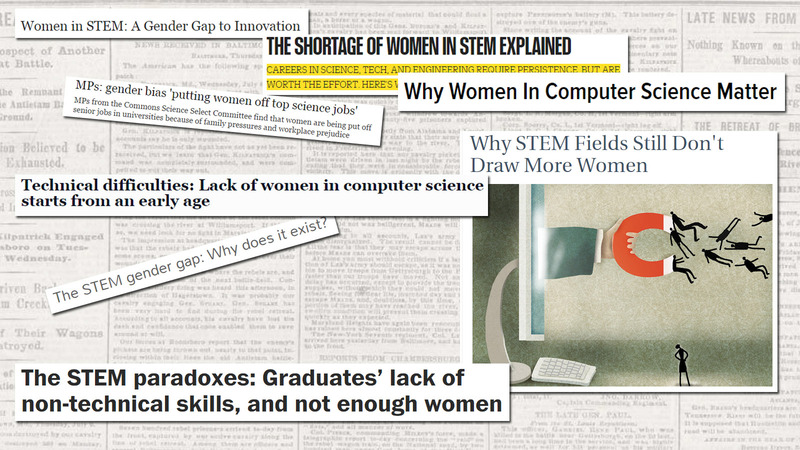 So, the question remains: why are women so poorly represented when it comes to STEM careers? – lack of female role-models/mentoring. It would appear that we have an idea of the barriers to female uptake of STEM subjects and accessibility to Higher/Further Education has never been better due to the digital age but what’s being done to address these barriers? When you’re dealing with deep-rooted gender stereotyping, regardless of the context, change will not happen overnight. That’s a given. But on a practical level, a lot can be done to promote, support and encourage female students (and Educators) to consider the wealth of opportunities and rewards of a STEM orientated career. And to my surprise and delight, this is happening both in the UK and further afield. We strive to deliver our vision and purpose by working with thousands of schools, colleges and STEM employers, to enable young people of all backgrounds and abilities to meet inspiring role models, understand real world applications of STEM subjects and experience hands-on STEM activities that motivate, inspire and bring learning and career opportunities to life. How exciting. They even have STEM Ambassadors, who work on a voluntary basis, helping to ‘fight the cause’ and encourage young people to consider studying STEM subjects and provide an insight into career prospects, using real-life experiences. DIGITS was created by a unique coalition of Massachusetts science and technology associations that worked collaboratively to tackle the problem of the diminishing pipeline of students interested in science, technology, engineering, and math (dubbed STEM by the National Science Foundation) careers. To my shame, I had never heard of Architectural Visualisation prior to studying a Diploma in Interior Design. However, I’ve always been drawn to the subject of Computer Science. I studied IT at GCSE level and attended a Computer Programming course at University, before coming to the conclusion that Computer Programming didn’t appeal to my creative side. Unfortunately, it took many years before I discovered the awesomeness of Architectural Visualisation and more importantly it appealed to BOTH my technical AND creative strengths. How many female students are out there, completely oblivious to the fascinating world of 3D Visualisation? Female students that may have an interest in Computer Science, combined with a natural creative flair? And how many of them are unaware of the professional and personal sense of achievement that can be realised by working in the Architectural Visualisation field? As a female Architectural Visualiser, I recognise and acknowledge the importance of helping to promote, encourage and support the uptake of STEM subjects by females (and in my case, with specific reference to Computer Science). STEM Ambassador? I’m on it.